HomeoPet Anxiety Relief is a safe and natural homeopathic liquid given to your pet to promote calmness. It helps with anxiousness associated with separation, travel, loud noises, veterinarian or groomer visits, or any other stressful situation. Helps calm fears associated with a vast array of stressful situations Good for new puppies or existing pets to relieve the stress of a new environment and new animal relationships No reported side effects How it Works: The homeopathic ingredients in HomeoPet Anxiety Relief work synergistically to ease anxiety and promote a sense of calm in your pet. HomeoPet TFLN Anxiety Give your furry pal a moment of Zen with the HomeoPet Anxiety TFLN Dog, Cat, Bird & Small Animal Supplement. Because sometimes your pet has trouble just taking a deep breath, this homeopathic liquid helps to promote calmness during the big ?TFLN? stressors of thunder, fireworks, and loud noises. Drawing on hundreds of years of natural medicine therapy, the all-natural ingredients work to synergistically relieve anxiety during these common triggers. The chemical-free formula actually helps to buffer the noise that pets hear, as well as their reaction to atmospheric changes caused by approaching storms. FDA-registered homeopathic anxiety drops are clinically proven to promote a sense of calmness in dogs, cats, birds, and small animals. Treats the common ?TFLN? triggers of thunder, fireworks, and loud noises by buffering the sounds pet hear and their reaction to atmospheric changes. Helps to relieve barking, whining, pacing, panting, cowering, trembling, running away, nausea, destructive behavior, and more. Chemical-free formula uses the best all-natural, pure ingredients based on years of research, and causes no known side effects. Non-sedating and safe for all pets including puppies, kittens, pregnant, and nursing animals. Easily administer by mouth or through food or water. HomeoPet Skin and Itch Relief Get your pet in cuddle-worthy shape with the HomeoPet Skin & Itch Dog, Cat, Bird & Small Animal Supplement. Working to detoxify the skin from the inside out, this homeopathic liquid provides temporary relief to that pesky itching, scratching, gnawing, and hair loss caused by seasonal allergies. Drawing on hundreds of years of natural medicine therapy, the all-natural formula uses only the purest, chemical-free homeopathic ingredients that cause zero known side effects. Easily administer by mouth or food or water?your itchy pet will thank you, and you?ll love his luxurious skin and coat! Homeopathic drops promote temporary relief for dogs, cats, birds, and small animals suffering from seasonal allergies. Detoxifies the skin and improves the coat while relieving constant itching, scratching, gnawing, and hair loss. Chemical-free formula uses the best all-natural, pure ingredients based on years of research, and causes no known side effects. Non-sedating and safe for all pets including puppies, kittens, pregnant, and nursing animals. Easily administer by mouth or through food or water. Fast-acting liquid drops are made in the USA and registered with the FDA. HomeoPet Travel Anxiety Give your furry pal a moment of Zen with the HomeoPet Travel Anxiety Relief Dog, Cat, Bird & Small Animal Supplement. Because sometimes your pet has trouble just taking a deep breath, this homeopathic liquid helps to promote a sense of calmness. Drawing on hundreds of years of natural medicine therapy, the all-natural ingredients work to synergistically relieve anxiety in a variety of stressful travel situations. Whether your pet suffers from motion sickness, fear of the car, or uneasiness during flying, the drops quickly help to eliminate cowering, trembling, nausea, pooping, destructive behaviors, and other common symptoms of stress and anxiety. FDA-registered homeopathic travel anxiety drops are clinically proven to promote a sense of calmness in dogs, cats, birds, and small animals. Use for pets with motion sickness, or who have a fear of traveling including cars, boats, trains, and airplanes. Chemical-free formula uses the best all-natural, pure ingredients based on years of research, and causes no known side effects. Helps to relieve barking, whining, pacing, panting, cowering, trembling, drooling, nausea, destructive behavior, and more. Non-sedating and safe for all pets including puppies, kittens, pregnant, and nursing animals. Easily administer by mouth or through food or water. HomeoPet Digestive Upsets Settle your pet?s unpredictable stomach with the HomeoPet Digestive Upsets Dog, Cat, Bird & Small Animal Supplement. Designed to offer fast relief to common digestive problems, this homeopathic liquid is great for pets with diarrhea, nausea, constipation, loss of appetite, gas, and bad breath. Drawing on hundreds of years of natural medicine therapy, the all-natural formula uses only the purest, chemical-free homeopathic ingredients that cause zero known side effects. Easily administer by mouth or food or water, and then you can look forward to a happy pet?and less messes to clean up. Homeopathic drops promote temporary relief from common digestive issues in dogs, cats, birds, and small animals. Use to relieve minor problems like vomiting, diarrhea, constipation, loss of appetite, bad breath, and gas. Also for cats that throw up after eating. Chemical-free formula uses the best all-natural, pure ingredients based on years of research, and causes no known side effects. Non-sedating and safe for all pets including puppies, kittens, pregnant, and nursing animals. Easily administer by mouth or through food or water. Fast-acting liquid drops are made in the USA and registered with the FDA. Homeopet Feline Wrm Clear Give your cat the relief that nature intended with the HomeoPet Feline WRM Clear Cat Supplement. Offering a drug-free approach to treat tapeworm, hookworm, roundworm, and whipworm, this homeopathic liquid aids in the recovery of worm infestations, and also reduces the chance of re-infestation by suppressing egg production. Drawing on hundreds of years of natural medicine therapy, the all-natural formula uses only the purest, chemical-free homeopathic ingredients that cause zero known side effects. Easily administer by mouth or food or water. Homeopathic drops treat hookworms, roundworms, tapeworms, and whipworms in cats. Works to gently create an environment where worms cannot live, so they are flushed harmlessly from the body without being killed. Chemical-free formula uses the best all-natural, pure ingredients based on years of research, and causes no known side effects. Non-sedating and safe for all cats including kittens, pregnant, and nursing cats. Easily administer by mouth or through food or water. Fast -acting liquid drops are made in the USA and registered with the FDA. Takes 2 weeks to reach full potential. HomeoPet WRM Clear Give your pet the relief that nature intended with the HomeoPet WRM Clear Dog, Cat, Bird & Small Animal Supplement. Offering a drug-free approach to treat tapeworm, hookworm, roundworm, and whipworms, this homeopathic liquid aids in the recovery of worm infestations, and also reduces the chance of re-infestation by suppressing egg production. Drawing on hundreds of years of natural medicine therapy, the all-natural formula uses only the purest, chemical-free homeopathic ingredients that cause zero known side effects. Easily administer by mouth or food or water. Homeopathic drops treat and prevent hookworms, roundworms, tapeworms, and whipworms in dogs, cats, birds, and small animals. Works to gently create an environment where worms cannot live, so they are flushed harmlessly from the body without being killed. Chemical-free formula uses the best all-natural, pure ingredients based on years of research, and causes no known side effects. Non-sedating and safe for all pets including puppies, kittens, pregnant, and nursing animals. Easily administer by mouth or through food or water. Clinically-proven liquid drops are made in the USA and registered with the FDA. Takes 2 weeks to reach full potential. HomeoPet Leaks No More Your pet doesn?t like dribbling any more than you do, and the HomeoPet Leaks No More Dog, Cat, Bird & Small Animal Supplement helps put an end to that. Designed to relieve urinary incontinence, this homeopathic liquid is ideal for puppies, senior animals, and spayed females or neutered males. Drawing on hundreds of years of natural medicine therapy, the all-natural formula uses only the purest, chemical-free homeopathic ingredients that cause zero known side effects. Easily administer by mouth or food or water. Homeopathic drops offer relief for dogs, cats, birds, and small animals with urinary incontinence. Helps prevent leaking and puddling in puppies, seniors, and spayed females or neutered males. Chemical-free formula uses the best all-natural, pure ingredients based on years of research, and causes no known side effects. Non-sedating and safe for all pets including puppies, kittens, pregnant, and nursing animals. Easily administer by mouth or through food or water. Fast-acting liquid drops are made in the USA and registered with the FDA. Homeopet Feline Digestive Upsets Settle your kitty?s unpredictable stomach with the HomeoPet Feline Digestive Upsets Cat Supplement. Designed to offer fast relief to common digestive problems, this homeopathic liquid is great for cats with problems such as constipation, loss of appetite, and vomiting. Drawing on hundreds of years of natural medicine therapy, the all-natural formula uses only the purest, chemical-free homeopathic ingredients that cause zero known side effects. Easily administer by mouth or food or water, and then you can look forward to a happy cat?and less messes to clean up. Homeopathic drops promote temporary relief from common digestive issues specifically in cats. Use to relieve minor problems like constipation, loss of appetite, food regurgitation, and throwing up 20 minutes after eating. Chemical-free formula uses the best all-natural, pure ingredients based on years of research, and causes no known side effects. Non-sedating and safe for all cats including kittens, pregnant, and nursing cats. Easily administer by mouth or through food or water. Fast-acting liquid drops are made in the USA and registered with the FDA. 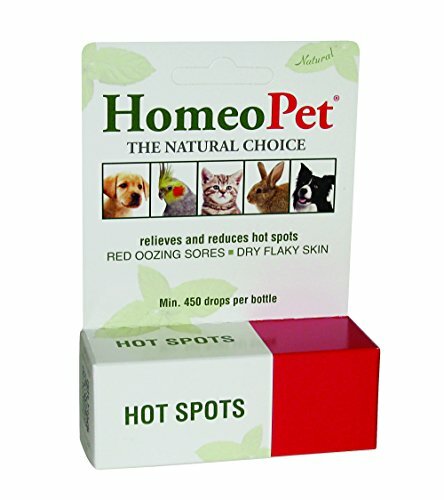 Homeopet Bug Bites Give your itchy pet some relief with the HomeoPet Bug Bites Dog, Cat, Bird & Small Animal Supplement. A natural remedy intended to soothe allergic dermatitis caused by fleas, bugs, and insect bites, this homeopathic liquid is safe and gentle healing in a bottle. Drawing on hundreds of years of natural medicine therapy, the all-natural formula uses only the purest, chemical-free homeopathic ingredients that cause zero known side effects. Easily administer by mouth or food or water, and be sure to treat your pet and his surroundings to prevent further bites. Homeopathic drops for use on dogs, cats, birds, and small animals suffering from allergic dermatitis due to bug bites. Helps promote healing of itchy, irritated, and scabbed skin caused by fleas bites, mosquito bites, ant bites, bee stings, and hives. Chemical-free formula uses the best all-natural, pure ingredients based on years of research, and causes no known side effects. Non-sedating and safe for all pets including puppies, kittens, pregnant, and nursing animals. Easily administer by mouth or through food or water. Fast-acting liquid drops are made in the USA and registered with the FDA. Medicated to relieve hot Spots that are red, oozing or dry flaky. Supports healing where hair loss occurs from chewing and licking the effected area. Homeopet Liver Rescue helps to remove them from the organs and give overall health and energy a boost. Drawing on hundreds of years of natural medicine therapy, the all-natural formula uses only the purest, chemical-free homeopathic ingredients that cause zero known side effects. Easily administer by mouth or food or water, and then get ready for a little extra pep in his step. Homeopathic drops for use on dogs, cats, birds, and small animals to remove environmental toxins from organs. Improves energy and boosts overall health after decreased liver function and lethargy caused by toxins like sprays, shampoos, and preservatives. Chemical-free formula uses the best all-natural, pure ingredients based on years of research, and causes no known side effects. Non-sedating and safe for all pets including puppies, kittens, pregnant, and nursing animals. Easily administer by mouth or through food or water. Fast-acting drops are made in the USA and registered with the FDA. Specifically formulated for all types of respiratory problems, including sinus infection or inflammation. Dosing for Dogs/Cats under 20 lbs/10 kg, 5 drops; 20-100 lbs/ 10-50 kg, 10 drops; over 100 lbs/50 kg ,15 drops. In acute cases the doses can be given every 15 minutes for the first hour, every 30 minutes in the second hour, once in the third hour, then reducing to 1 dose 3 times daily. For cases that are not acute one dose 3 times daily, once a response is seen the administration should either be reduced until symptoms reappear or ceased until symptoms reappear. If any reduction in dose or frequency leads to immediate recurrence of symptoms, then medication should be continued with a reduction being done every 12-21 days to check that the medication is providing control rather than relief of symptoms. Dosing for Small mammals, exotics and birds: 3 drops in drinking water daily. For severe cases a drop can be diluted in 1 ml of water or other oral rehydration fluid and given to the patient orally taking care to avoid aspiration of the fluid into the respiratory tract by the patient. This can be repeated as for cats and dogs where the case is acute, but with a volume of fluid suited to the patient. Ingredients: Hepar Sulp. Calc., Kali I., Gels. Semp. Nat. Ars., Mur. A.., 6&30c in 20% USP alc. In purified water.